While the basic Seicento was very much a city shopping car - effectively a rounded-off version of the previous Cinquecento - it was also massively entertaining to drive, even in humble 899cc 40bhp form. The addition of a ‘Sporting’ model, then, was not quite the oxymoron that its name might suggest, despite a meagre power output of just 54bhp. While the horses might not have been chomping at the bit, the Sporting differed from lesser Seicentos thanks to shorter springs, firmer dampers and a close-ratio gearbox, which gave it pin-sharp handling and zippy acceleration. Indeed, the gearbox was by far its most entertaining feature, happy to be shunted through the ratios with all the delicacy of a rally driver, allowing you to wring every last drop out of each of the bhp on offer. There was even an Abarth version, with larger alloys and a bodykit, along with the Seicento Schumacher, inspired by the German F1 ace’s fondness for the tiny Fiat, both of which took the concept further with a zingy sports exhaust and additional race-inspired bling. It was far from perfect, of course. The dashboard, such as it was, was cheap and cheerless, as well as an ergonomic disaster, the passenger parcel shelf’s party trick was to eject its contents onto the passenger’s lap, and the tiny pedals and offset driving position made long journeys rather too much of a chore. 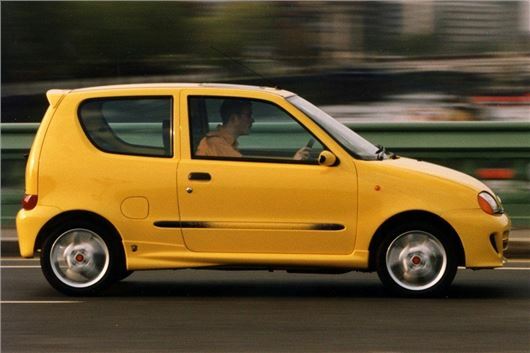 At 3.3-metres long, the Seicento was also the shortest four-seater car on the UK market for most of its life, though those in the back were rarely comfortable - unless they were in love. But these flaws are immediately offset by the Seicento’s assets. As well as being huge fun to drive over short distances, the Sporting is also bursting with character - something that many of the cars of its era completely lacked. Like all great Italian cars, its cheeky personality made it so much easier to forgive its frustrations. So what about its classic credentials? Well, the Sporting already has a following, with really nice examples fetching as much as £2000, but the good news is that it’s still perfectly possible to find a good one for less than that - bank on as little as £500 for something with a reasonable MoT and in presentable condition - but be wary of rust around the rear sub-frame and signs of head gasket failure, both of which are known bugbears for the model.